Purdue University will launch its 150th anniversary and theme of Giant Leaps in solving worldwide problems during Homecoming, but Engineering alumni are already on board. 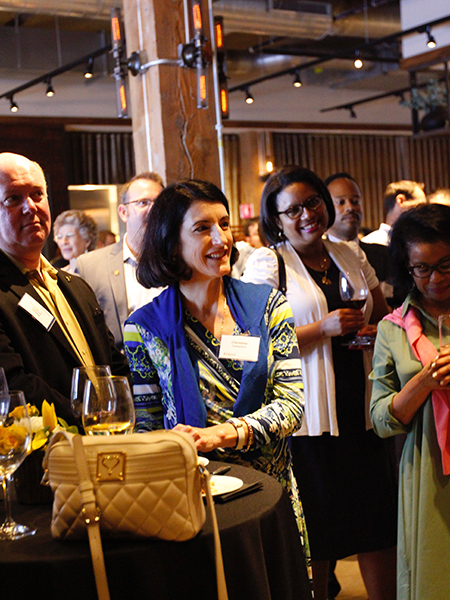 In August, Don and Liz Thompson (BSEE ’84 and ’85) hosted the first event, kicking off a yearlong celebration of Purdue Engineering alumni gatherings in support of the University’s 150th anniversary with a reception at their Chicago restaurant, Taste 222. 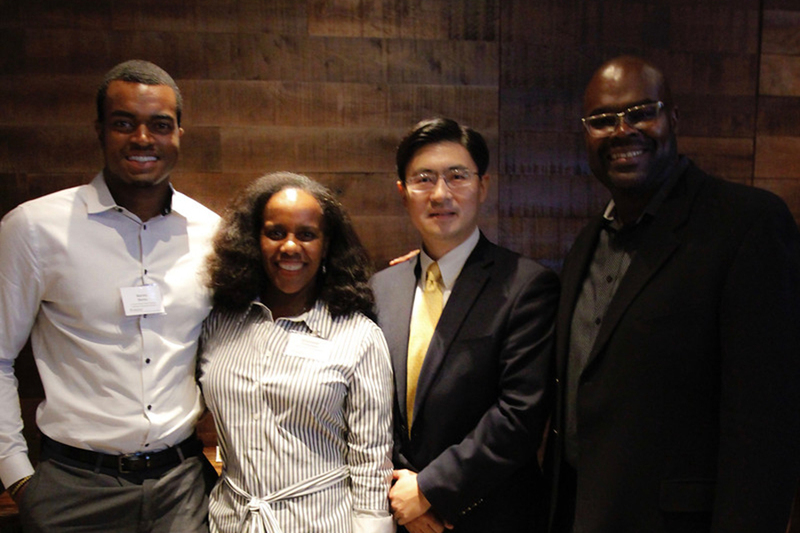 Alumni Don and Liz Thompson's Chicago reception, with Aaron Banks (current Engineering student, Purdue student body president and member of the football team) and Dean of Engineering Mung Chiang in attendance. The reception was a pre-kick-off event for Purdue Engineering alumni gatherings to celebrate the University’s 150th anniversary. Hosting the event was a natural fit for the Thompsons, whose belief in educating individuals and strengthening communities anchors both their business strategy and personal commitment to Purdue. The couple met as high school students during a Purdue summer engineering program for underrepresented students; each earned a Purdue electrical engineering degree; and they have continued to enthusiastically support Purdue, most recently with a $1 million endowment for the Minority Engineering Program. 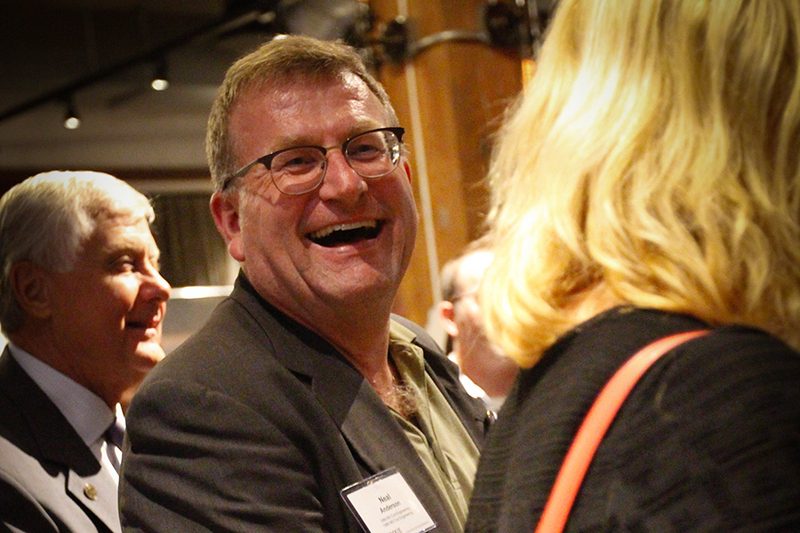 More than 160 attendees from the greater Chicago area gathered at the event, with guests ranging from a May 2018 graduate to those with over 65 years of industry experience. They included Mung Chiang, Purdue’s John A. Edwardson Dean of the College of Engineering, and Purdue Student Body President Aaron Banks, an Industrial Engineering major and a quarterback for the Boilermaker football team. Don Thompson has maintained a close connection to his alma mater as a member of the Purdue Board of Trustees since 2009. He is the CEO of Cleveland Avenue, an investment group and accelerator that he founded in early 2017 with a focus on building new food, beverage and restaurant concepts. Thompson began his career at Northrop Corporation in 1984 and went on to a 25-year career with McDonald’s Corporation, where he served as President and Chief Executive Officer from 2012 to 2015. The couple’s Taste 222 restaurant is the showcase for Cleveland Avenue, which is named for the avenue in Chicago’s Cabrini-Green community where the Thompsons grew up, as well for their firm, whose mission is to foster growth for a new generation.